Two 4th Grade students from George Hays-Jennie Porter Elementary went today to FLL Robotics Tournament held at Lakota Freshman Campus. While they didn't compete, they went to observe, learn, and get inspired for the competition next year. They were also cheering two Robotics Teams from AMIS that are organized by SHPE Cincinnati (Society of Hispanic Professional Engineers). And they made friends with the winning team of "Brick Girls"
Great tournament, and great experience for the students! A big "Thank You" to Families Forward for their ongoing support for the computer & Robotics program, as well as to West End Development Fund for donating the Robots! 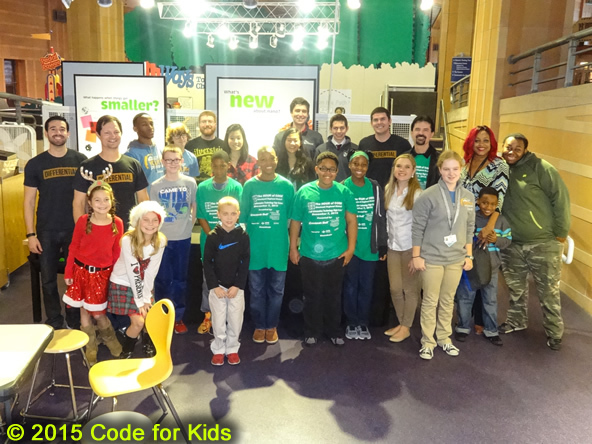 Students from two West End Cincinnati schools: George Hays-Jennie Porter Elementary and Taft IT High School, were invited to Museum Center to be the coaches for the "Hour of Code" organized by the Museum Center. Also invited were InterAlliance, Cintrifuse, and Differential. It is a huge honor for both schools, showing that the recent efforts in the schools to be more focused on IT are paying off! Congratulations to both schools, their Principals, teachers, staff, and most of all - to the students! Well done! Also a big "Thank You" to the wonderful staff of the Museum Center for inviting them, to Families Forward for their ongoing support for the Computer & Robotics program, as well as to West End Development Fund for donating the Robots! Computers are everywhere, but fewer schools teach computer science than 10 years ago. Girls and minorities are severely underrepresented. Good news is, we’re on our way to change this. In one week last year, close to 80 million people tried computer science! Computer science was on homepages of Google, MSN, Yahoo! and Disney. President Obama, Malala, and other celebrities kicked off the Hour of Code with videos. Over 100 partners came together to support this movement. 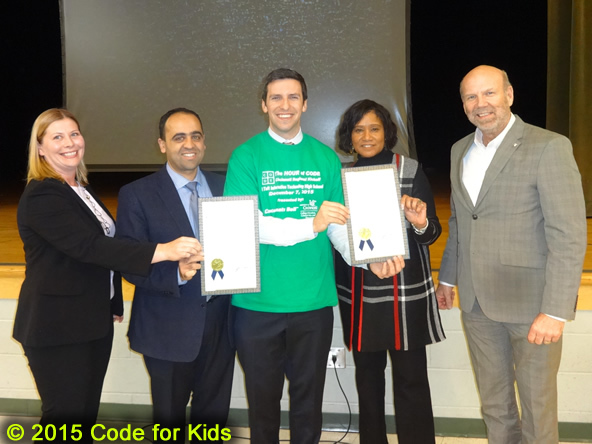 This year The Hour of Code movement is aiming for 100 million students. Taft Information Technology High School organized on Dec. 7, 2015 at the Cincinnati Regional Kickoff for this largest learning event in history. Organized by the nonprofit Code.org and over 100 others, the event is a statement that today’s generation of students are ready to learn critical skills for 21st century success. The Cincinnati event was presented by the UC School of Information Technology and Cincinnati Bell, both of which have been on the forefront of promoting Information Technology to schools, and are instrumental in transforming the TaftHigh School into an "Information Technology" High School! The goal of the event was to bring together organizations, companies, teachers, as well as children from local schools and their parents, to make them aware of IT opportunities in the global world, and to promote IT Education in Cincinnati. This event couldn't take place without the support of several organizations and companies, especially Dr. Hazem Said from School of Information Technology at the University of Cincinnati and Mr. Steve Smith from Cincinnati Bell - the Presenting Sponsors, as well as BDPA Cincinnati, SHPE Cincinnati, XOOPS Foundation, and the Taft Alumni Association - Supporting Sponsors, and finally P.G. Sittenfeld from the Cincinnati City Council. A big "Thank you" to students and teachers from George Hays-Jennie Porter Elementary for their participation, and a huge "Thank you" to our hosts, the staff of Taft It High School: Ms. Monica Keenon, Ms. Celietta Beamon, and the Principal, Mr. Michael Turner! 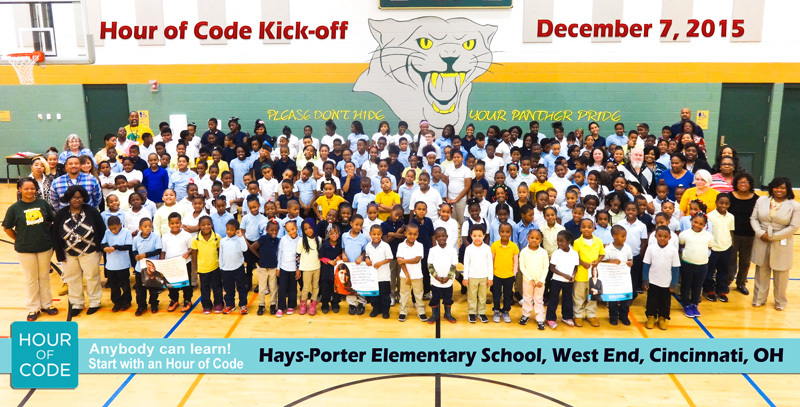 Hays-Porter Elementary starts "Hour of Code"
According to School Principal, Ms. McClain, during that week all students in the school will participate in this first ever school-wide "Hour of Code" training. Several of Hays-Porter students, who participated in After-School computer classes organized by Families Forwards , have been also invited by the Museum Center to be coaches for their "Hour of Code" outreach. They will also be acting as coaches at the Regional Kickoff for "Hour of Code", taking place tonight at Taft Information Technology High School, 6pm-9pm. 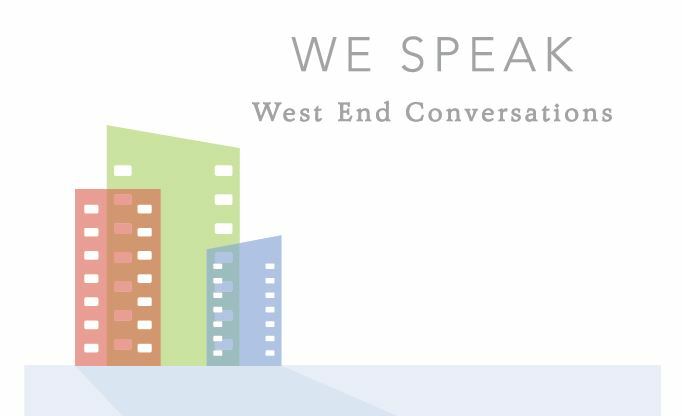 If you care about the West End, we want to hear what you have to say. What do you value most? Is it education, programs for youth, safety, quality housing, or something else? What do you want to see in the West End? 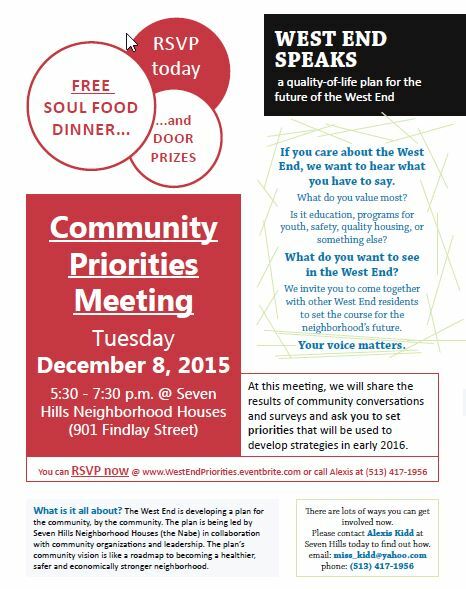 We invite you to come together with other West End residents to set the course for the neighborhood’s future. Your voice matters. At this meeting, we will share the results of community conversations and surveys and ask you to set priorities that will be used to develop strategies in early 2016. 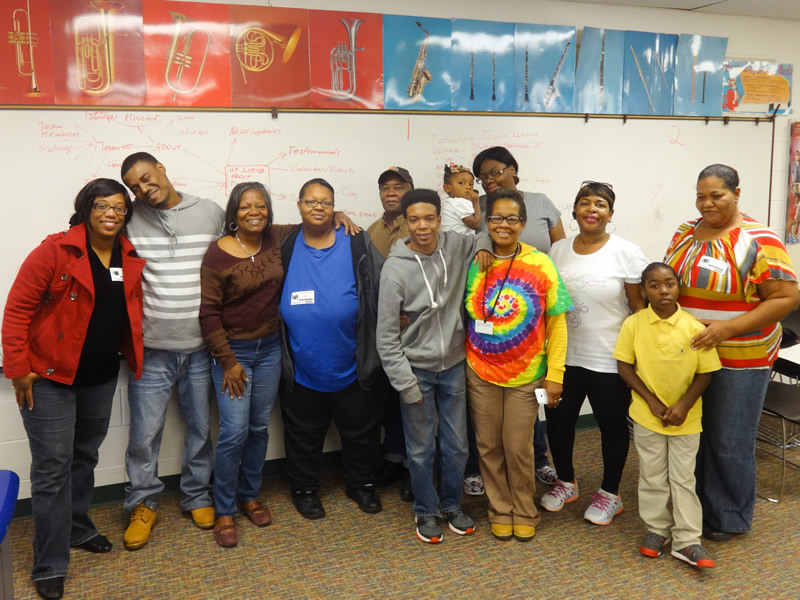 Several West End families of students attending Hays-Porter Elementary School are participating in Toyota Family Learning program. This program, led by Beech Acres Parenting Center, is helping families in West End forge a new movement of families learning together, gaining new skills, contributing to their communities, and sharing what they've learned with other families—within and also beyond school walls, on the go, and using technology. Previous projects have shown that when children and families solve community issues together, they are simultaneously learning and applying 21st century college and career readiness skills. Today the families spent two hours working on a plan for their Website, identifying required content and dividing tasks between team members. They are eager to make a difference in the West End community, while learning new skills together with their children, and then sharing them with other families in West End. Today the whole George Hays-Jennie Porter Elementary School got exposed to Robotics and to the upcoming "Hour of Code" event. 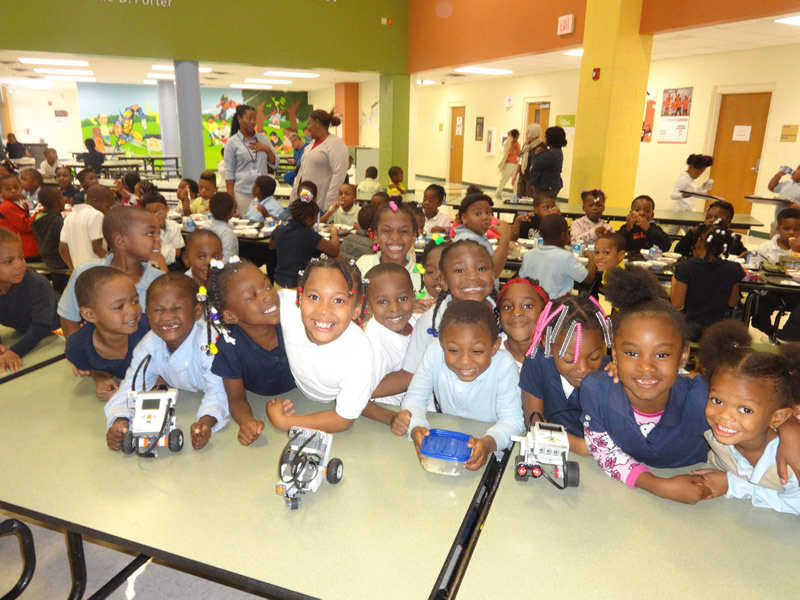 Close to 300 kids had the opportunity to experience hands-on Robotics and learn about the opportunities to do cool things with robots, as well as about job opportunities waiting for them. It was great to see so many excited students, who are now interested in exploring further the world of Robotics! We definitely could see several future scientists and engineers there! The school Principal Ms. McClain, and the whole staff, especially Ms. Richara Richardson, Ms. Victoria Matchett, Ms. Sandra Stanley, Ms. Carolyn Toney, and so many others, are making a huge difference there, and we are all so very thankful for their hard work!!! That’s why our entire community is joining in on the largest learning event in history: The HOUR OF CODE, during Computer Science Education Week (Dec. 7-13). 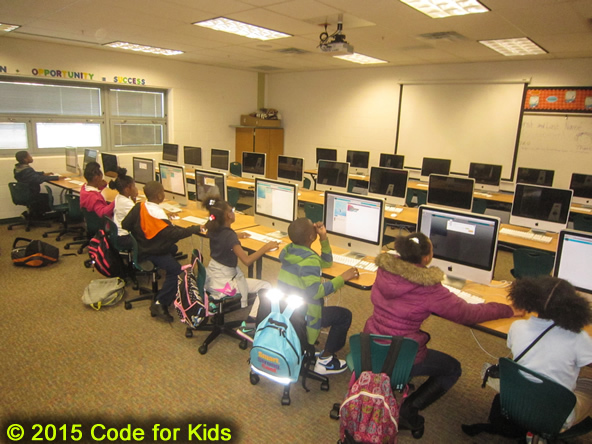 More than 136 million students worldwide have already tried an Hour of Code. The goal is to to bring together organizations, companies, teachers, as well as children from local schools and their parents, to make them aware of IT opportunities in the global world, and to promote IT Education in Cincinnati. On that day we will also have at the Taft Information Technology High School a public viewing of the documentary called "WEB". The movie "WEB" follows Peruvian families living in remote villages in the Amazon Jungle and Andes Mountains as their children experience the One Laptop per Child (OLPC) program, gaining access to the Internet for the first time. Students at Hays-Porter Elementary School having fun learning how to build robots as part of FIRST Lego League program. 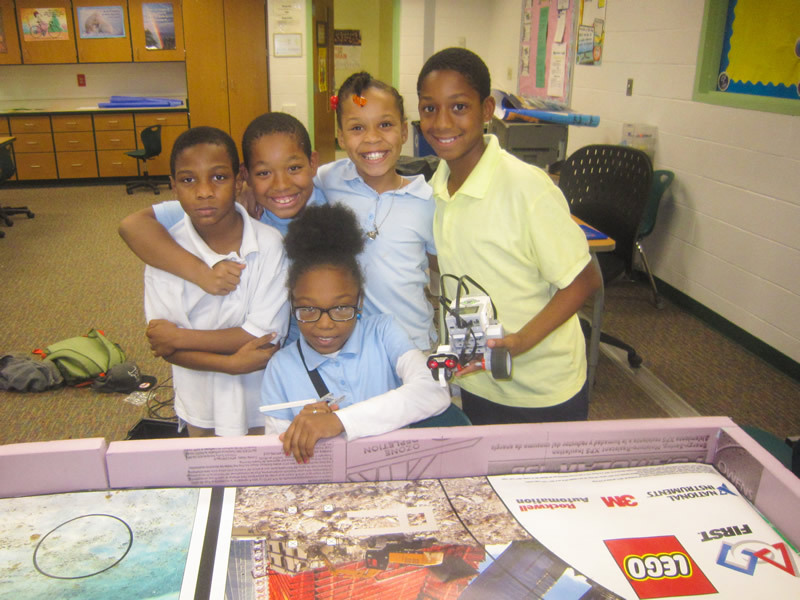 FIRST LEGO League’s positive impact on participants is gratifying and well documented. Over 88% are more interested in doing well in school, and 87% have more interest in attending college. 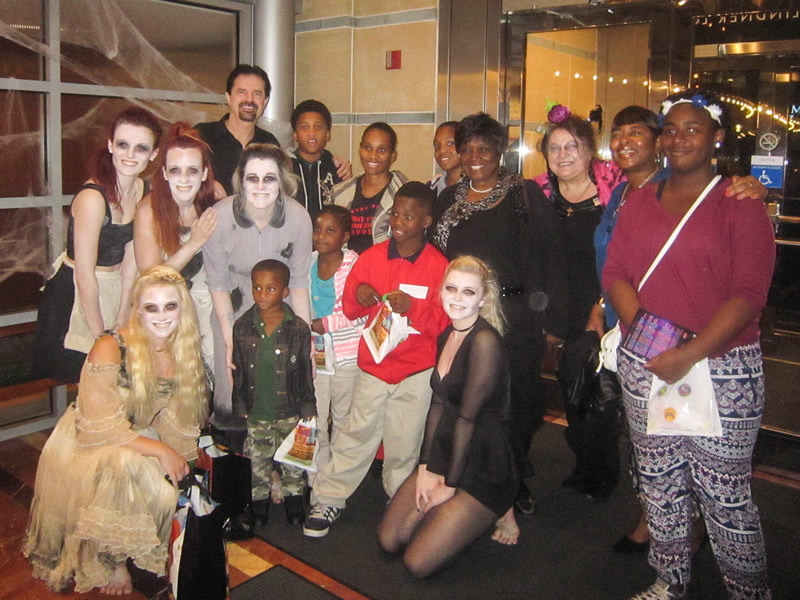 Several students from Hays-Porter Elementary School went to see the "Dead Can Dance" show being currently played at the Jarson-Kaplan Theater at Aronoff Center. Exhale Dance Tribe resurrected its popular Halloween-themed show/event. This fantastic show delivers eclectic, exciting choreography, melding elements of contemporary and jazz dance in their own idiosyncratic style. Exhale Dance Tribe is a contemporary jazz troupe comprised of Cincinnati-based performing artists and dance educators. Founded in 2001 by Andrew Hubbard and Missy Lay Zimmer, Exhale celebrates the full range of modern and rhythm-based dance and features diverse and versatile performers. Their programs, performances, and original choreographies speak to the region’s need for expressionistic and multi-lingual dance rooted in rhythmic language and storytelling. We would like to thank the Building Diverse Audiences Advisory Committee (BDAAC) of the Cincinnati Arts Association (CAA), and especially Ms. Joyce Bonomini, and Families Forwards with Ms. Victoria Matchett, for their help in making this happen! Even if we have more and more applications that use touch and move screens, the basic "typing" skill will remain an important skill to get a job for many years to come, as most jobs, especially the better paid jobs, require some degree of computer work, and knowing how to type quickly and efficiently will make people more marketable. As some experts say: "The bottom line is this – if you type with one or two fingers of each hand, the average person can probably manage 40-60 wpm (words per minute). If you learn to touch-type, you can increase that speed to 60-100 wpm. And this makes you better at whatever it is you do." Therefore this week we have practiced basic typing skills. The kids did an awesome job, staying focused on the task and constantly improving their score. Soon we'll have to organize a "Typing Championships"
The Hays-Porter Robotics Club needs a special table for the practice with robots. 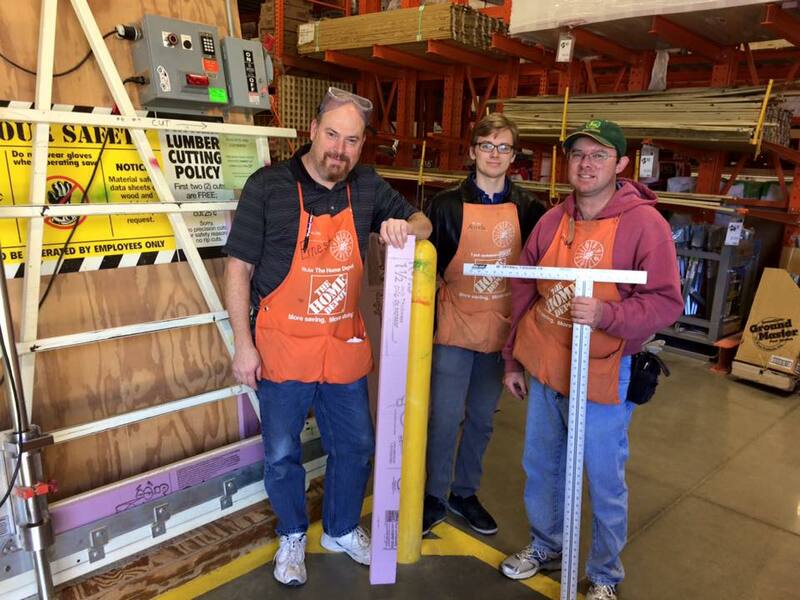 The team from Home Depot in Crescent Springs was very helpful in cutting the right pieces for us, really going the extra mile to help us! It's a new school year, and thanks to Family Forwards, the After-School computer classes are back in the Hays-Porter Elementary School. Since this class was the first one in this school year, we've teamed up the students who joined us for the first time with the returning students, who taught them Angry Birds from Code.org in 10 minutes. After that, it was time for a little competition for the new students, while their "coaches" motivated them from the sidelines. The "coaches" did fantastic job explaining the game, because the new students did awesome job! Even a grandmother of one of the students joined in to learn and participated in the competition, which was fantastic! This will be a very fun school year! The West End Community Council is committed to do whatever it takes to help our residents to find a job, and to receive any required training that will make finding a job an easier task. For more information please visit the "Ohio Means Jobs" Website, and attend future meetings of the Community Council, as the representatives from Ohio Means Jobs will distribute information and updates about upcoming Hiring Events and jobs training opportunities. Partnership for Innovation in Education (PIE) received ArtsWave Grant for “Build a Better Ballet Shoe” Case Learning Opportunity, and is teaming up with Hays-Porter Elementary School to give its students the opportunity to use their problem-solving and decision-making skills to design an ergonomically better ballet shoe through a new STEAM (Science Technology Engineering Art Math) case learning opportunity. The program was developed by Partnership for Innovation in Education (PIE) along with its case partners: the Cincinnati Ballet, Cincinnati Dancewear, Wellington Orthopaedic & Sports Medicine, Stages for Youth and Cincinnati Public Schools. 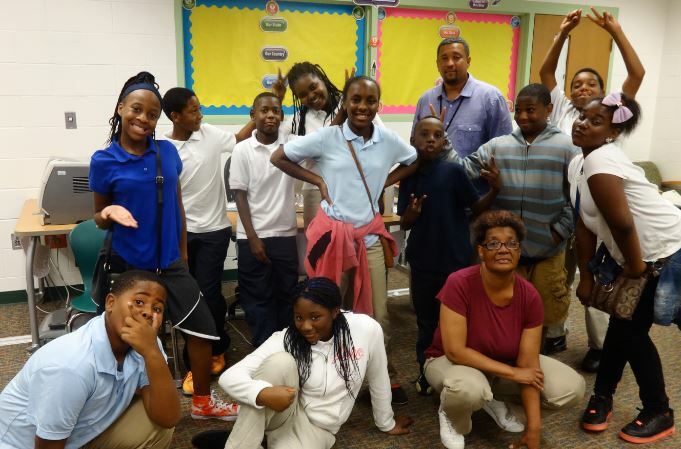 ArtsWave has awarded PIE a $10,975.00 grant to help fund the development and implementation of this innovative program. As part of “Build a Better Ballet Shoe,” students will study the anatomy of the leg, computer-aided design (CAD) and computer-aided manufacturing (CAM) modeling and the relationship to a dancer’s technique and movement to develop a ballet shoe designed to provide more comfort and help prevent physical stress and injury. This is an exciting program with kids having a lot of fun, but also learning mechanical engineering as well as programming skills. The FIRST LEGO League introduces younger students to real-world engineering challenges by building LEGO-based robots to complete tasks on a thematic playing surface. 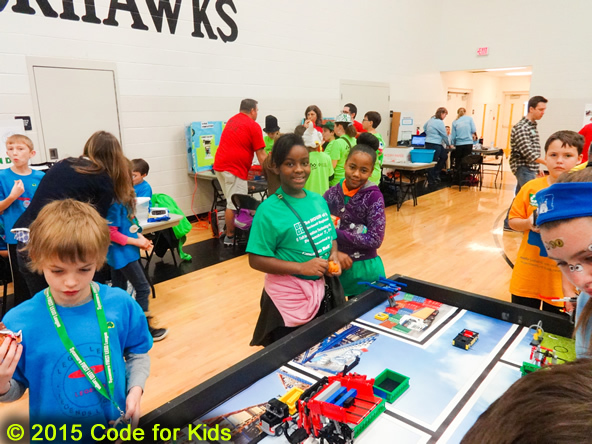 FIRST LEGO League teams, guided by their imaginations and adult coaches, discover exciting career possibilities and, through the process, learn to make positive contributions to society. What FIRST LEGO League teams accomplish is nothing short of amazing. It’s fun. It’s exciting. And the skills they learn will last a lifetime. The students of Hays-Porter will now have the opportunity to experience all of this by participating in the FIRST LEGO League! We hope all residents, business owners, students, educators and West End Stakeholders will join us for our Community Conversations. at the 7 Hills Neighborhood House, this Saturday, 2pm -4 pm. These stories and other community conversations will be the beginning of input from residents into a community Quality of Life plan. We are proud to have been selected as one of the expanded Place Matters communities. Plan to attend and let us hear your voice! For more information please visit the "Ohio Means Jobs" Website, or view the attached PDF document. Please invite all your West End friends who are looking for a job or training opportunities. 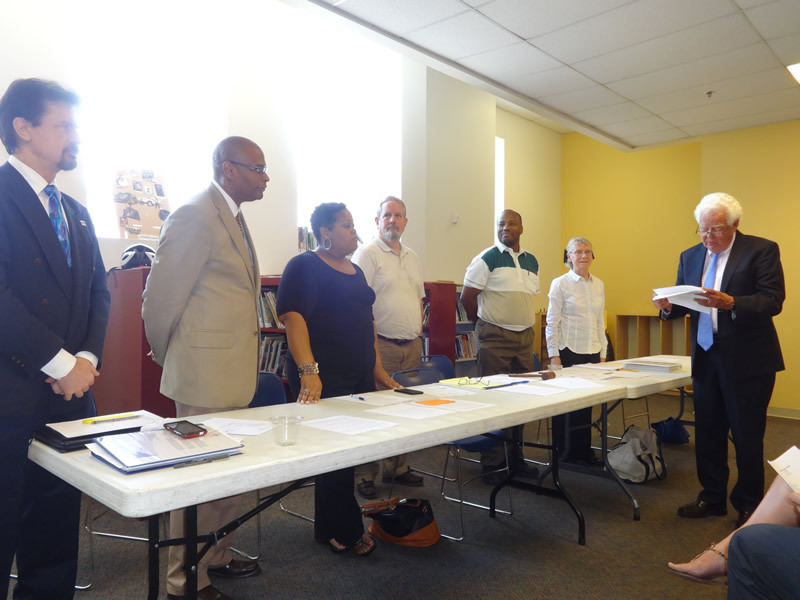 On July 21st, 2015, David Mann, Cincinnati Vice Mayor, installed newly elected officers of the West End Community Council. Also present was State Representative Christie Kuhns. The new President is Keith Blake. The new Vice President is Dave Petersen. The new Recording Secretary is Linda Petersen. The new Corresponding Secretary is Michael Beck. The new Treasurer is Jemelle Howard. The new Financial Secretary is Robert Killins.